As of Jan. 1, certain antimicrobial drugs of human medical importance have changed marketing status from over-the-counter (OTC) to Veterinary Feed Directive (VFD). The American Feed Industry Association supports the judicious use of antimicrobial drugs and is working to ensure members are compliant with the recent change. 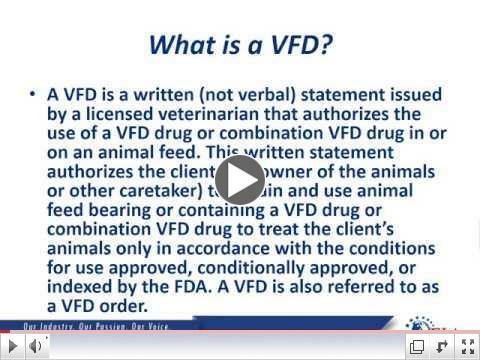 Throughout the industry there are resources for veterinarians, feed manufacturers and producers that members can use to better understand what is required by their facilities under the new VFD rule. Click here to see FDA’s overview of these areas. However, due to high demand, AFIA created a training module on VFD preparedness, which targets retail distributors (i.e. farm stores and co-ops), something previously unavailable. Click the video to watch the training. It is a narrated presentation that walks viewers through the key points of the VFD process and what is required on a VFD form. Additionally, AFIA’s created a sample completed VFD form available as a reference tool along with a PowerPoint slide deck that can be printed. The training module can be found here. AFIA suggests companies make this training module (and resources) available to employees that are accepting VFD feed orders. If you have questions or seek additional information, contact Preston Buff, AFIA director of regulatory affairs, at (703) 558-3568.